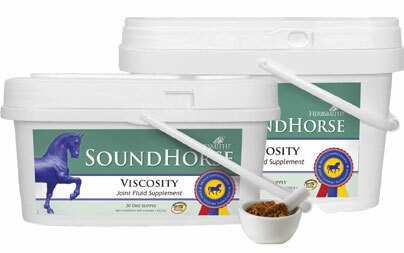 SoundHorse Viscosity is a veteriniarian-developed, glucosamine-based formula that aids in joint support by maintaining the normal viscosity of joint fluid while managing aches and discomfort. Use with any of the Herbsmith Impulsion line blends for optimal joint care. Cautions: Not for use in pregnant animals. Execute caution in using this product in animals: with clotting disorders; being treated with anticoagulant medications; diabetes, or any metabolic disorder causing hyperglycemia; history of urinary tract stones; known allergies to shellfish; may be a GI irritant. If lameness worsens, discontinue use and contact your veterinarian. Administer during or after the animal has eaten to reduce incidence of gastrointestinal upset. An examination from a veterinarian is recommended prior to using this product. Not for use within 48 hours of surgery/anesthesia.